A bull was briefly on the loose in Brooklyn Tuesday, and it just might have saved itself from the slaughterhouse. Michael George reports. Police have finally corraled an elusive bull calf at a Brooklyn park. 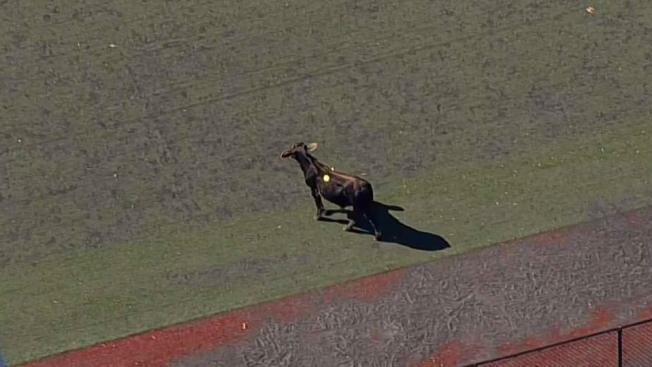 The NYPD says the bovine escapee was first spotted on the loose late Tuesday morning, before it made its way into a park near Prospect Park Expressway. Despite several attempts by police to corner the cow on the field, the animal managed to keep sprinting off. A crowd of onlookers outside the field swelled in a matter of under an hour, Chopper 4 shows. The cow wandered around, staring back at the people and occasionally breaking into a jog. At one point, police tried to corner the cow by putting up soccer nets but the cow just ran through them, knocking down the goal posts. "You don't see this every day in Brooklyn, a bull in Prospect Park," said Brandon Simmons. "It's just crazy." The NYC Parks Department got in on the cow craze, tweeting jokingly, "Hey, has anyone seen a cow?" Hey, has anyone seen a cow? Finally, at around 1:15 p.m., the NYPD managed to tranquilize the bull calf and put it into a Mounted Unit horse trailer. It was taken to Animal Care Centers of NYC with the help of SPCA, and will be cared for until a new home is found, the NYPD later tweeted. It's not clear where the animal came from. Police believe it may have escaped from a building on 16th Street and Fourth Avenue, though they're still trying to confirm that. "Hopefully he has a second chance at life," said Jody Cook-Tesoriero, one of the bystanders. Earlier this year, another New York City cow made national headlines when it escaped a Queens slaughterhouse and led police on a wild, hours-long chase through the neighborhood. The bull died hours later. And in 2016, former "Daily Show" host Jon Stewart rescued a bull that escaped another slaughterhouse in Queens before being lassoed and tranquilized by police.